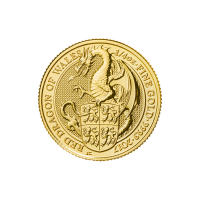 Pièce d'argent Valiant de la Royal Mint 2018 de 10 onces Order your 10 oz 2018 Royal Mint Valiant silver coin from our store online, to enjoy the web's lowest price. 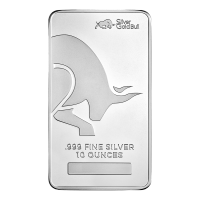 The Royal Mint celebrates the timeless tale of St. George and the dragon with this dazzling silver coin. 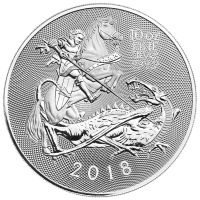 The reverse feature is a dynamic rendering of St. George on horseback, at the moment when his lance pierces the dragon's hide; this artful scene is set against a field of light refracting, micro-engraved dot texturing which appears to fan out from the St. George’s position like a halo of light. 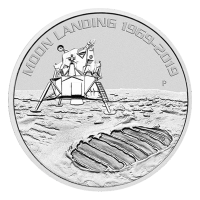 Also on the reverse, the coin's year of issue, as well as details of weight, metal content and purity. 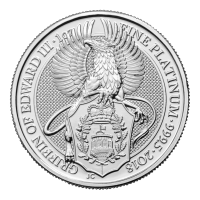 The obverse bears an artist's rendering of Elizabeth II in profile, also set to magnificent effect against a field of micro-engraved dot-texturing. 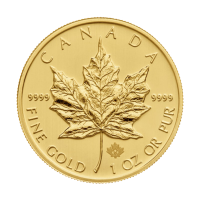 Also on the obverse, Elizabeth II regal title, as well as the coin's unique denominational value. The dragon depicted was, according to legend, terrorizing a town, which the hero encountered on his travels. 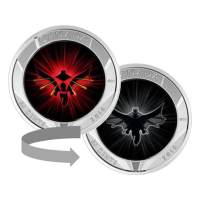 Not only did he bring peace back to the townspeople, he also rescued their fair princess, from deep in the dragons lair ….more than worthy of commemoration in coin! 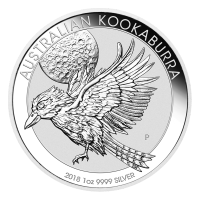 Celebrate both British storytelling and diversify your portfolio with a 10 oz 2018 Royal Mint Valiant silver coin today.